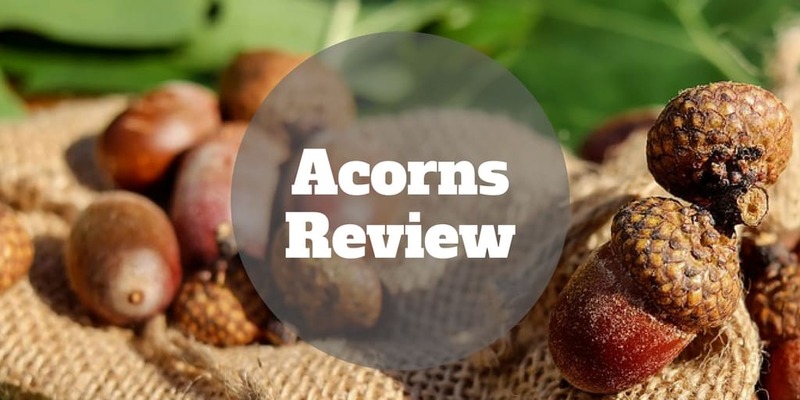 Home › Investing › Acorns Review 2019 – Invest Spare Change Automatically! Acorns is a mobile app that combines automatic saving with investment management. It links to your credit cards and debit cards so that each time you buy something the “loose change” is rounded up to the nearest dollar and invested on your behalf. The investment account is managed by a computer algorithm similar to a robo-advisor. And the whole process from start to finish requires no effort on the part of users (after signing up!). It is free for college students for up to 4 years, and costs just $1 per month for standard accounts or $2 per month for retirement accounts – unless you have a balance of $5,000 or more in which case an annual 0.25% management fee applies. Is Acorns Right For You? As long as you have a .edu email address, Acorns is 100% free to use for up to 4 years. It is an ideal way to squirrel away a few nuts without having to think about where to invest or how to invest, especially at a time when money may already be tight. It’s hard to argue that $1 per month is particularly expensive when you factor in all the Acorns app can do: save and invest automatically on your behalf. Nevertheless, if you have just $20 invested and $12 disappears over the course of the year to management fees, it’s obviously a bad deal! But once you have a few thousand dollars invested the fees become very reasonable, and especially so when you have $5,000 or more at which time the flat monthly fee transitions to an annual percentage fee on assets. Investors who want to take control over their money and how it is invested would do better a brokerage firm like thinkorswim or tastyworks, which hands responsibility for investment selection to clients. But for hands-off investors who prefer to avoid the hassle of picking stocks or ETFs, Acorns is a match. Every time you buy something, whether at a grocery store or gas station, the spare change is swept into an investment account and allocated to a diverse portfolio of low cost exchange-traded funds. Acorns pricing is rock bottom. For taxable accounts, a buck monthly is hard to beat. And for retirement accounts, called Acorns Later, two bucks a month is charged up to the first $5,000. Account balances of $5,000 and above are subject to a 0.25% fee, which is very much line with the management fees applied by Betterment, Ellevest, and other top robo-advisors. And Acorns earns high marks for providing its service free to college students who have a .edu email address. With respect to fees, Acorns is more attractive than its competitor Stash, which also charges $1 monthly but doesn’t automate and manage investments. If you compare Acorns vs Robinhood, which charges no commissions then Acorns loses out on price. But Robinhood won’t automate saving money and requires clients to pick stocks so it’s more of an apples-to-oranges comparison. Acorns investment strategy is rooted in Nobel-prize winning academic research, called Modern Portfolio Theory. Dr. Harry Markowitz, the father of Modern Portfolio Theory, and Nobel prize winner is on the Acorns board. The big idea behind Modern Portfolio Theory is to diversify an investment portfolio across asset classes in order to maximize returns for a given level of risk. Although everyone would love to “beat the market”, few have the skill, luck or timing needed to do so consistently. Investing in a diverse group of exchange-traded funds is widely accepted as a smart way to invest for non-professional investors. Acorns links to your bank account and sweeps ‘rounded-up’ cash amounts from transactions into an investment account, which is invested in a diversified portfolio aligned with your risk tolerance and financial goals. Sophisticated investors can invest a lump-sum amount as well as set up recurring deposits on a regular schedule. First begin by connecting your bank checking account to what’s called your Round-up account. Once you’re setup is complete, you can start using Acorns. Let’s say you pay for a coffee that costs $3.24, the rounded-up amount, $0.76, is added to what’s called your Round-Up balance. Once your Round-Up balance has at least $5 in it, the money will be swept from your bank account into your Acorns investment account. You can customize which transactions you want selected for your Round-Up account or choose the automatic setting which counts all eligible transactions. It’s also possible to set up recurring deposits on a regular schedule each day, week or month. And if you prefer, you can invest a lump sum amount of $20,000 or $30,000 too. ✅ Free To College Students: For up to 4 years, college students who do not have any earned income can take advantage of Acorns at no cost as long as a valid .edu email address is provided. ❌ No Tax-Loss Harvesting: Many robo-advisors, such as Wealthfront, offer free tax-loss harvesting services to create a tax-efficient portfolio but Acorns comes up shy on this feature. ✅ Low Investment Minimums: To set up an account at Acorns, no deposit is required and just $5 is needed to get started investing. ❌ Acorns Vs Betterment: Compared to Betterment, Acorns offers a narrower selection of asset classes. ✅ Found Money: Acorns has an excellent partnership program which allows users to get cash back automatically by linking a card to an Acorns account when you use certain services, such as Hulu, Airbnb and Jet. ✅ Great Education: Acorns does a good job teaching beginner investors how to get up to speed with investing basics. Acorns does so via a publication it calls Grow Magazine, which is a personal finance site featuring content relating to student loans, credit card debt and other topics that Millennials will find especially valuable. ✅ Automatic Savings: Acorns helps individuals struggling to save to automatically squirrel away a few nuts (or acorns!) for a rainy day. Without effort, daily transactions turn into a nest-egg that grows as part of a diversified portfolio of stocks and bonds. ✅ Lump-Sum & Recurring Investments: If you prefer to make a large deposit or set up recurring investments, both are possible via the Acorns app. ✅ Acorns Later: Acorns caters to retirement portfolios similarly to standard, taxable portfolios via its Acorns Later product. Acorns has low expense ratios, low management fees on amounts over $5,000 and hidden fees are not a concern when transferring or closing an account. A drawback of Acorns is that only taxable accounts are supported at this time. No IRA or 401(k) retirement accounts are supported. While free rebalancing is supported, tax-loss harvesting is not a feature Acorns provides. Investors who care about automated tax-loss harvesting should consider other alternatives, such as Wealthfront. Data transfers are encrypted to ensure your money is protected using the highest security protocols. Acorns makes it easy to save and invest automatically. Spare change from ordinary transactions can add up to produce a handsome nest-egg. The low management fees, especially on large account balances, low investment minimums, top notch education in-app, and free account balancing combine to make Acorns one of the best investment apps period. If you struggle to save, Acorns offers a way to build an investment portfolio effortlessly and almost invisibly. ‹ Stash Review 2019 – Start Investing With Just $5!